The Buffalo River Biltong Tjom Camo Knife with its dedicated biltong knife design is the perfect gift for any occasion. The Biltong Tjom knife is the perfect little gift for any biltong lover. 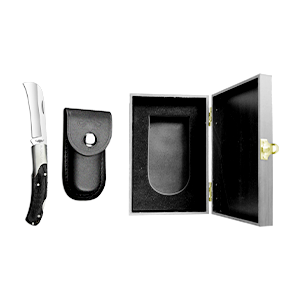 Its sharp thick curved blade accompanied by the sturdy handle makes it easy to cut through biltong like butter. Comes with Genuine Leather Carry Pouch and Wooden Box.